I am a brawler. Always been. But also a cunning wrestler. I pace my opponent until he starts to fade, then I use my brutal strength to dominate the fight knowing he’s every move. I will use a brutal body slam with a high body splash , leaving my opponent powerless before I go in for the kill. I wrestle like a hunter playing with he’s prey. Coming from a long line of professional bodybuilders and martial artists (JKA) I became a professional bodybuilder. Also a actor in many international movies like Sweet n Short (Leon Schuster) operation weisdorn (Marius weyers) Last man in africa (Sean Connery). And also known as Mike Mitchell as the wrestling wimpy champ. 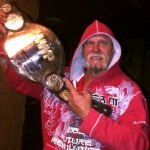 I am the current WWP all africa champ and also a serious biker with my own club called “Steel Knights“. I live life like there is no tomorrow, giving my fans what they pay for. My motto is Action speaks louder then words. Respect – Discipline – Honor – Loyalty.